One of our readers has recently submitted these photos on a gift they received with their new Visa Black Card. We are assuming that this is just the initation gift, and that users that spend more over time will get more “luxurious gifts” as part of the $495/year membership. 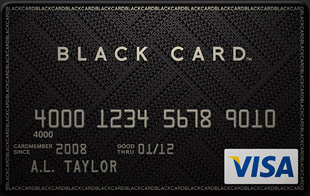 Congratulations on becoming a Visa Black Card member. 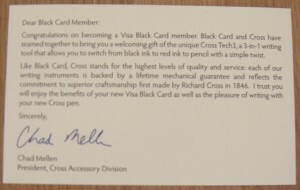 Black Card and Cross have teamed together to bring you a welcoming gift of the unique Cross Tech3, a 3-in-1 writing tool that allows you to switch from black ink to red ink to pencil with a simple twist. Like Black Card, Cross stands for the highest levels of quality and service: each of our writing instruments is backed by a lifetime mechanical guarantee and reflects the commitment to superior craftsmanship first made by Richard Cross in 1846. 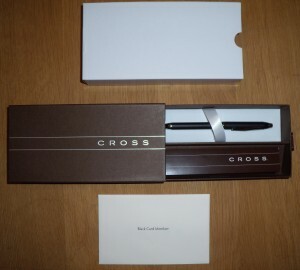 I trust you will enjoy the benefits of your new Visa Black Card as well as the pleasure of writing with your new Cross pen. Steve Colbert on his show The Colbert Report makes fun of racial issues and the Visa Black Card: “Visa: it’s everywhere you want to be, unless that place is a Jimmy Buffett concert. 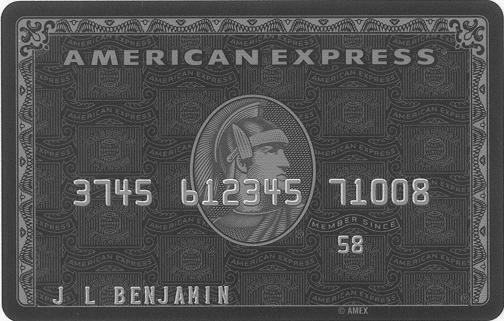 (01:55)” Colbert also correlates Visa’s vague 1% requirements and statement that the card is “not for everyone” as an implication of Visa behaving in a racist manner (he’s joking of course! ).